Söderberg & Partners is one of the biggest financial players in Scandinavia. We’ve been their digital design partner since 2015, working on a design system that underpins their external web & customer portals, and brings all their services together under one cohesive digital brand. The visual design is simple and bright, with subtle touches that create a recognisable style. Since we were working with the complex and (let’s face it) often boring subject of finances, it was important that the service felt light and approachable, without becoming anonymous. 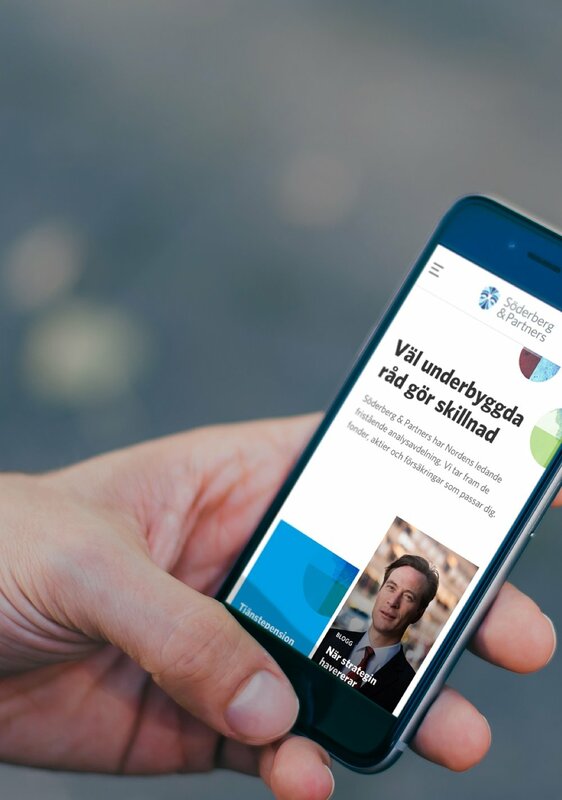 Until quite recently, printed brochures were the key touchpoint where Söderberg & Partners showcased their services - our goal was to replace them with a web that would convert just as well, if not better. One of the biggest challenges was the amount and diversity of services Söderberg & Partners provide. We needed to make sure users found what they needed and that each service was communicated in the best way possible, but still felt like a part of a greater whole. We worked with financial advisors and employees from a number of departments to make sure the design was flexible enough to accommodate their needs, and set strict rules for use to maintain uniformity. This is our design delivery and does not represent the final produced website, as it was built by another party, and out of our control. When we began working with the customer portal, the plan wasn’t to rehaul the entire system. Söderberg and partners had divided their services into different digital products, each with their own login. We proposed creating a more modular and personalised service, so that users could access all the services they needed from one single login. The difficulty in creating a new design for a diverse set of services was making everything feel like the same product. By creating few, but flexible components, we could create unique pages for each service while maintaining a seamless user experience. We recorded a number of interviews with financial advisors and their clients, to be shown on the website. Since Söderberg & Partners have offices all around Sweden, we wanted to ensure the content was relevant for all users. We cut four different versions of the case-film, on for each of Sweden’s four largest cities, and serve a different version based on your localisation data. This is a huge project, with a number of different product owners and several types of users - all with their own needs and often strong wills. We kept our team small - three designers from start to the end - only adding temporary support to the team when there was a need for it. During the early stages of the project, new orders and requests would come in constantly, without dedicated time to take a look at what we we’re designing from a holistic perspective. We held the responsibility for making sure the design was cohesive, and often had to retrace our steps in addition to delivering new screens and components. This wasn’t sustainable in the long run. To make this more effective, we started working actively with a design system. Instead of allowing the project to grow bigger and bigger, we broke the project down into smaller projects, delivering bits of the system biweekly, and continually collecting feedback. Because the product and subject is complex, we would constantly discover new needs which would challenge previous assumptions. By delivering the project in smaller pieces, we could constantly test and evolve our components to create a more flexible and more practical overall system. Instead of retroactively updating a bunch of designs, we only needed to update the design system, maintaining a “single point of truth” library of components that developers could refer to. Because of the design system, we could constantly speed up our projects. If the first project took six weeks from beginning to end, because we needed to start from scratch and think up a lot of design components, the last project - with a similar scope - took more like two weeks. We simply made wireframes that showed which modules of the design system should be where. The few new modules that were needed were then designed and documented in the design system.